"That's what you guys should be writing and covering," new White House press secretary Sean Spicer angrily lectured reporters on Saturday during his first remarks from the podium of the press briefing room. He was referring to the delay in Senate confirmation for President Donald Trump's pick to lead the CIA, Congressman Mike Pompeo, but the comment came after a long digression about how many people had shown up to watch Trump be sworn in as president. "This was the largest audience to ever witness an inauguration, period," Spicer said, contradicting all available data. Aerial photos have indicated that former president Barack Obama's first inauguration attracted a much larger crowd. Nielsen ratings show that Obama also had a bigger television audience. Spicer said, without any evidence, that some photos were "intentionally framed" to downplay Trump's crowd. He also expressed objections to specific Twitter posts from journalists. And he said, "we're going to hold the press accountable," partly by reaching the public through social networking sites. His statement included several specific misstatements of fact in addition to the overarching one. "This is the first time in our nation's history that floor coverings have been used to protect the grass on the Mall," Spicer said, claiming that this "had the effect of highlighting areas people were not standing whereas in years past the grass eliminated this visual." In fact, coverings were used for Obama's second inauguration in 2013. "This was also the first time that fencing and magnetometers went as far back on the Mall, preventing hundreds of thousands of people from being able to access the Mall as quickly as they had in inaugurations past," Spicer said. In fact, a United States Secret Service spokesperson told CNN, no magnetometers were used on the Mall. 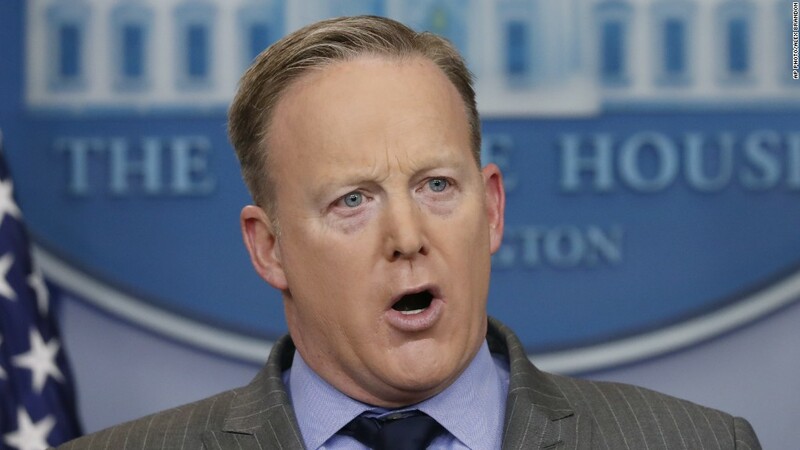 And Spicer said, "We know that 420,000 people used the D.C, Metro public transit yesterday, which actually compares to 317,000 for president Obama's last inaugural." Spicer's number for ridership on Friday was actually low -- the correct number, according to Metro itself, was 570,557. But there were actually 782,000 trips taken for Obama's second inaugural in 2013. Spicer, at times almost yelling while reading a prepared statement, took no questions. CNNMoney called his cell phone a few minutes later; he did not answer. Some longtime White House correspondents were stunned by the tirade. Glenn Thrush of The New York Times wrote on Twitter, "Jaw meet floor." "I've run out of adjectives," wrote Chuck Todd, the moderator of NBC's "Meet the Press." Karen Tumulty of the Washington Post said Spicer's assertion about "what you guys should be writing" was "chilling." Reactions were overwhelmingly negative, and not just from journalists. Ari Fleischer, who had the same job as Spicer during the George W. Bush administration, tweeted, "This is called a statement you're told to make by the President. And you know the President is watching." And Brian Fallon, who was in line to become press secretary if Hillary Clinton had won, wrote, "Sean Spicer lacks the guts or integrity to refuse orders to go out and lie. He is a failure in this job on his first full day." Conservative commentator Bill Kristol said "it is embarrassing, as an American, to watch this briefing by Sean Spicer from the podium at the White House. Not the RNC. The White House." The White House alerted the press corps to Spicer's statement more than an hour ahead of time. The CNN television network made a choice not to broadcast the Spicer statement live. Instead, the statement was monitored and then reported on after the fact. Former Democratic congressman Steve Israel, who recently joined CNN as a commentator, said, "This isn't a petty attack on the press. It's a calculated attempt to delegitimize any questioning of @realDonaldTrump by a free press." Spicer's statement came two hours after Trump spoke at CIA headquarters and described his "running war with the media." Trump spent several minutes of that speech complaining about news coverage. In his remarks, Spicer suggested Trump would bypass traditional media outlets he believes are unfairly reporting on his presidency. "The American people deserve better, and so long as he serves as the messenger for this incredible movement, he will take his message directly to the American people, where his focus will always be," Spicer said. Spicer was joined in the Brady Press Briefing Room by members of his new White House press and communications staff, who are still moving into their offices and learning the way around the West Wing. He tellingly led off his short statement with his tirade against the media, leaving announcements about phone calls with the leaders of Canada and Mexico, and announcing that Trump would meet with British Prime Minister Theresa May, to the end. During those announcements, Spicer incorrectly referred to Mexican President Enrique Peña Nieto as "prime minister." -- CNN's Kevin Liptak contributed reporting.